Watch your movies where you want to, when you want. 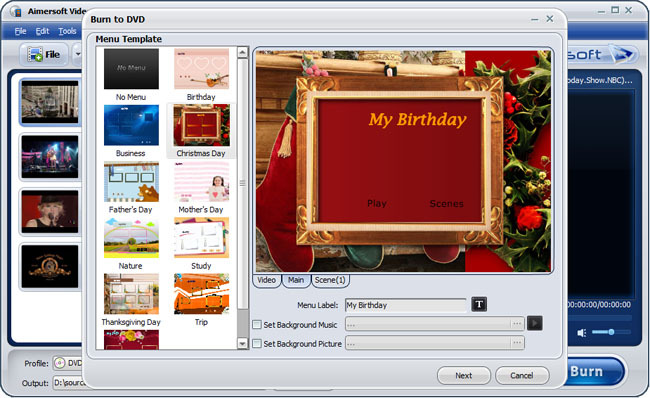 Aimersoft Video Converter Ultimate combines a DVD burner, DVD ripper, video converter, 3D movie creator and editing tool into one powerful program letting you conveniently manage all your video in one place. Unlock your movies from DVD disc or free them from your hard drive and do more! At a Glance: Every aspect of your movie is at your fingertips thanks to a clean, intuitive interface. It'll Do Everything but Make the Popcorn. With over 30 major video formats to choose from, take virtually any video from you digital camera, online video sites like Hulu, YouTube, Google video, etc. and watch it anywhere. Here are just a few of the 30 + available video formats to optimize your video:TS, HD AVI, HD WMV, HD MOV, HD AVI, MTS, M2TS, AVI, MP4, WMV, MPEG, MOV, FLV, MKV, 3GP and more. Legally remove DRM (Digital Rights Management) protection from movies and music bought from iTunes, Napster, Pandora, Amazon, BBC iPlayer and other DRM protected media centers in WMV, WMA, M4P, M4A, M4V, AAC, M4B, ASF, MP4, etc. and convert them to other media formats. Convert audios or get just the dialogue or soundtrack from a movie without the video and convert it to a format to fit any media player. Also take screenshots of your favorite scenes and save the in JPG or BMP formats to share anywhere. Here are just a few of the 20 + audio formats to optimize your audio: MP3, FLAC, AIFF, WMA, M4P, M4A, AAC, M4B, and more. Convert any 2D video in AVI, MKV, MOV, MP4 and more to 3D videos. Aimersoft Video Converter Ultimate now features 3D amazing fun to your videos in all popular formats from whatever sources including online video sharing sites, digital camera, phone cam and more. 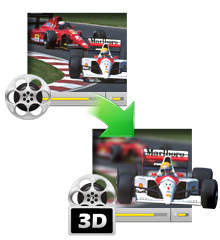 The 3D Video Converter well supports the main stream 3D media players. So you can convert any normal movies to 3D movies which are playable on almost all popular 3D players at home. Rip and convert DVD to HD video formats like HD MOV, HD WMV, HD AVI and standard video formats like WMV, AVI, MP4, FLV, MOV, MPEG, 3GP, etc. while preserving the high quality of DVD. Extract audio from DVD to MP3, WMA, AAC and take screenshots of your favorite scenes and save them in BMP or JPG format. This DVD video converter supports iPad, iPod, iPod touch 3, iPod nano 5, Zune, iPhone, iPhone 3GS, OS 3.1, iPhone 4(4G), Apple TV, PSP, PS3, Xbox 360, Archos, Sandisk, Motorola Droid/Cliq, Google nexus one, iRiver, Creative Zen, PMP, MP4/MP3 Player, Smart Phone, Pocket PC, PDA, Mobile Phone, etc. In just three easy steps, even a beginner can burn professional-looking DVDs complete with menus, background music and photos to DVD disc, DVD folder and ISO files. 1. Select the right menu template. 2. Set the background music and photo, name DVD label. 3. Set the video quality and DVD Disc type for your DVD. Easily download videos, TVs, movies, live sports and more from sites like YouTube, CNN, PBS, Yahoo, Google, and more. Capture and convert non-downloadable online videos from sites like Hulu, BBC, YouTube, Amazon Video on Demand and more by recording them via the professional built-in Video Recorder. 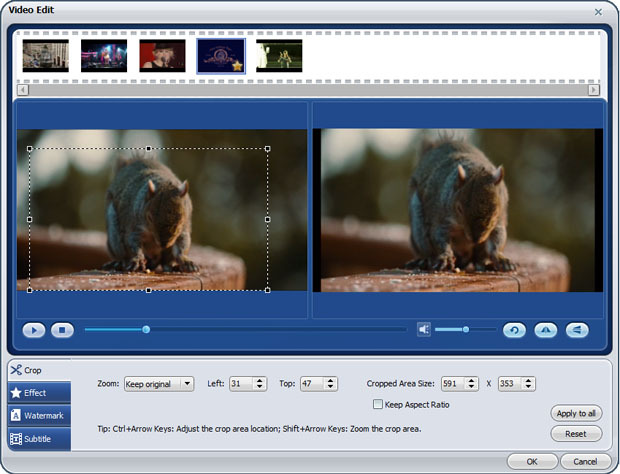 Crop your videos to keep only the parts you want while scaling them to keep the aspect ratio of the original DVD. Also, easily remove the black bars from DVD movie and video to watch it in true fullscreen. Adjust brightness, contrast, saturation, and add filter effects like Old Film, Emboss, Gray and Negative, as well as text or picture watermarks to really make your DVD or video your own. Trim the runtime of your favorite parts from DVD and video by setting the specific start time and end time. Also split a single video file into multiple ones by setting a specific split time or split size to ensure the perfect fit for your device’s screen. Video Converter Ultimate is optimized for NVIDIA® CUDA™ ensuring accelerated video decoding/encoding on a CUDA-enabled graphics card. The significant performance gain means prompt HD and SD video conversion, smooth playback and highest quality for all your favorite movies. Note: 6X faster conversion speed boost with NVIDIA® CUDA™ . Multi-threaded conversion ensures efficient and stable conversion of multiple files (video files, audio files, DRM files, DVD movies) at the same time. Also, to merge clips into one file, simply check the "merge into one file" box. Standard Video: M4V, AVI, MP4, MPG, MPEG, 3GP, 3G2, WMV, ASF, RM, RMVB, DAT, MOV, FLV, MKV, DV, NUT, H.264, NSV, VOB, DVR-MS ,etc. ASF, MOV, M4V, MP4-AVC, MP4-XviD, MP4-MC, WMV, MKV, AVI, XviD, DV, MPEG-1 NTSC, MPEG-1 PAL, MPEG-1 SECAM, MPEG-2 NTSC, MPEG-2 PAL, MPEG-2 SECAM, DVD-Video NTSC, DVD-Video PAL, DVD-Video SECAM, FLV, F4V, SWF, 3GP, 3G2, DivX, WebM, Divx HD, HD MKV, HD TS, HD TRP, HD AVI, HD MP4, HD MPG, HD WMV, HD MOV, etc. Apple iPhone, iPad, iPod,HTC, BlackBerry, Motorola, Nokia, Mobile Phones, Archos, PSP, PS3, Xbox 360, Wii, Creative ZEN, Sandisk Sansa, HTC Flyer, HTC Sensation, HTC Vivid, MOTOROLA XOOM, MOTOROLA RAZR, Samsung Galaxy S II etc. How to Use Video Converter Ultimate?